Habit: Perennial herb, taprooted, glabrous to minutely scabrous. Stem: erect, leafy, conspicuously fibrous at base, generally branched. Leaf: blade oblong to round, ternately or pinnately compound or dissected, leaflets oblong to obovate, entire to deeply pinnately lobed, segments linear to oblong. Inflorescence: compound umbels; bracts generally 0; bractlets 0 or inconspicuous; rays, pedicels few to many, spreading-ascending. Flower: calyx lobes minute; petals wide, white [+- pink]. Fruit: oblong to elliptic, +- compressed side-to-side; ribs +- equal, thread-like to narrowly winged; oil tubes generally several per rib-interval; fruit axis divided to base. Seed: face flat to concave. Species In Genus: +- 25 species: Eurasia, North America. Etymology: (Liguria, Italy, home of related Levisticum, lovage) Note: Genus and species poorly defined. Habit: Plant 2--8 dm, glabrous. Leaf: petiole 0.2--3 dm; blade 1--2.5 dm, oblong to triangular-ovate, 2-pinnate or ternate-pinnate, leaflets 1--4 cm, oblong to ovate, segments generally narrow, acute, deeply pinnately lobed; cauline leaves << basal, generally 1. Inflorescence: glabrous; peduncles generally whorled, terminal 1--3 dm, lateral < terminal, generally staminate; rays 5--18, 1.5--5 cm, unequal; pedicels 5--10 mm, unequal. Fruit: 4--5 mm, oblong-ovate; ribs narrowly winged; oil tubes 3--5 per rib-interval. Seed: face concave. Chromosomes: 2n=22,44. 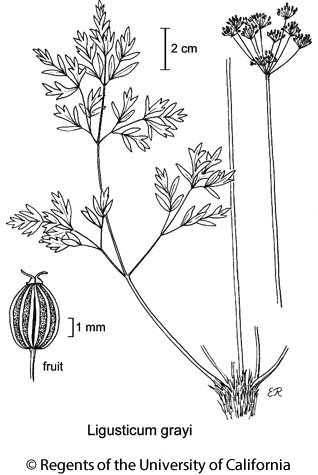 Citation for this treatment: Lincoln Constance & Margriet Wetherwax 2012, Ligusticum grayi, in Jepson Flora Project (eds.) Jepson eFlora, http://ucjeps.berkeley.edu/eflora/eflora_display.php?tid=30898, accessed on April 24, 2019. KR, CaRH, SNH, MP; Markers link to CCH specimen records. Yellow markers indicate records that may provide evidence for eFlora range revision or may have georeferencing or identification issues. Purple markers indicate specimens collected from a garden, greenhouse, or other non-wild location.